Menu for Hope 6 Canadian Entries - and away we go! Now the fun begins. Ring the bell, the bidding is open. In case you haven't heard, I am the proud host of the Canadian contribution to this year's Menu For Hope Campaign. Today's the day that this amazing worldwide event goes live, with monies raised going to benefit the United Nations World Food Programme's new initiative, Purchase for Progress. Here's how it works. 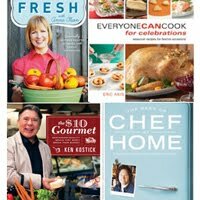 Food bloggers from around the globe have rallied together to offer a spectacular array of items upon which to bid. If you see something that catches your fancy, simply follow the instructions below to donate to the campaign. 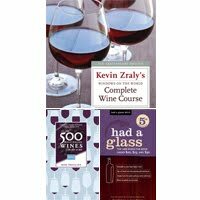 For each $10 donated, you get one bid towards the item of your choosing.Bidding will be open from today until December 25, 2009. Once bidding has closed, winners will be chosen at random and announced on Chez Pim on January 18, 2010. 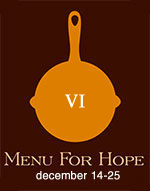 The master list for all Menu for Hope 6 bid items is available here, and a direct link to the donation site is here. Regional lists are being hosted by Shauna, Helen, David, Ed and Alder. For the goods on the Canadian listings, please read on. 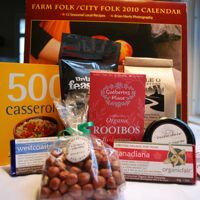 Note: these are the items hosted by Canadian food bloggers, but that does not necessarily mean that they are only available to Canadians. Most are available for international bidding, those items with shipping restrictions are noted at the end of the specific listing. But before we get into all of that, one last thing. Thank you to the friends who offered and organized items to be put towards this worthy cause, for devoting their time and effort to making this campaign a success. And thanks to you for reading, for your past support and for considering supporting again this time around. Thank you. We really mean it. I have filled a gift box with some of my most favourite things; the cookbooks I've been reading lately and the beautifully-designed items that inspire me every day. The winner will receive two of my cookbook picks from 2009, a selection of stationery (including papery goodness from simplesong design and The Beautiful Project, a copy of Uppercase magazine, and maybe a vintage treasure or two. To top it off I'll bake up a batch of cookies, just for you. 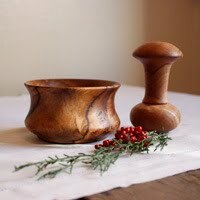 This mortar and pestle set from Herriott Grace, made especially for Menu for Hope, will most surely become a treasured heirloom. Each piece is hand-turned from a single piece of maple wood, without joints or glue. The mortar boasts a beautiful black grain with pretty markings throughout, while the pestle, from the same tree but higher on the branch, is slightly lighter in colour. The pair are joy to hold and a pleasure to use, fitting snugly in hand with a smooth, shiny finish. The mortar measures 4 inches at the rim, and 2 1/2 inches at its base; the pestle length is approximately 3 1/2 inches. 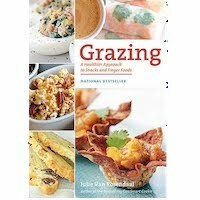 This revised and updated edition of Julie Van Rosendaal's best-selling cookbook Grazing provides grazers, party hosts and snackers with ammo against the vending machine, comfort when they need to relax and help when they need to feed a crowd. These delicious dishes are easy to make and low in fat, without ever compromising taste. 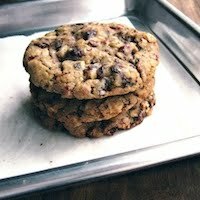 For most, the thought of a low fat cookie is impossible. 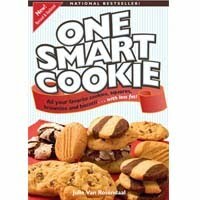 However, in the second edition of One Smart Cookie, Julie Van Rosendaal shows us that cookies and other sweets can still taste great even when they are lower in fat. Julie is certainly an expert in the field of low fat baking through her own successful low fat bakery as well as her diet-free weight loss of 165 pounds. Julie also shows you how to make your own favourite recipes healthier through helpful tips on substituting ingredients. Embrace your Inner Cookie Monster! Coming home to this package, donated by Jasmine of Confessions of a Cardamom Addict, will be a welcome treat when you want to regain your energies after a hectic day. 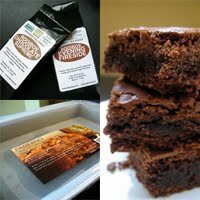 Along with two caffeine-free Roobios teas from Distinctly Teas (Evening Fireside and Chocolate Supreme), you will be sent a lidded Paderno 33x 23-cm/9x13-inch non-stick baking pan and the dry ingredients for one batch of Nick Malgieri's fabulous Supernatural Brownies. All you need to do is add butter, eggs and vanilla ... and of course heat. 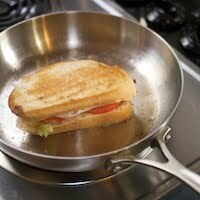 The full recipe will be included. EAT editors have assembled a prize package bursting with food items from the province of British Columbia, including the Farm Folks/City Folks 2010 calendar, a 20g bag of Untamed Feast’s delicious dried wild mushroom products (Forest Blend), locally grown roasted hazelnuts from Butler Hazelnut Farm, Vista d’Oro Farm’s Turkish Fig with Walnut Wine, a ½ lb. bag of Mile 0 Roasters Niagara Blend, Gathering Place’s Organic Rooibos Tea, and two chocolate bars from organicfair. Web Editor Rebecca Baugniet has also thrown in a signed copy of her latest cookbook. 3. Please specify which bid item you'd like in the 'Personal Message' section in the donation form when confirming your donation. You must write-in how many tickets per bid item, and please use the bid item code. Each $10 you donate will give you one raffle ticket toward a bid item of your choice. For example, a donation of $50 can be 2 tickets for EU01 and 3 tickets for EU02 - 2xEU01, 3xEU02. Got it? Good. Now, ready, steady, go!